From the Hancock County Courthouse, drive 0.7 miles west, following Hwy 22 and Hwy 16 to Ghettis Street. Turn right on Ghettis. The church with the cemetery behind it is less than 0.1 mile on your left. 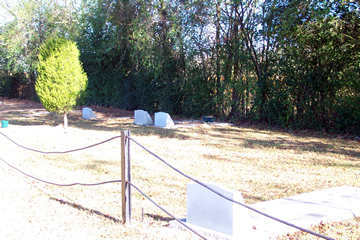 Holsey Memorial C.M.E. 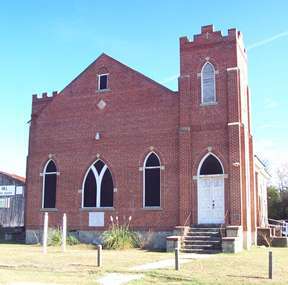 Church was erected in 1924 to the memory of Bishop L. H. Holsey, D.D. Graves numbered 20 or higher have been added to this list after the initial survey and are buried somewhere within the cemetery. "For God so loved the world. John 3:16"
"Our darling son" "In God's Care." Name on funeral home tag on grave. "Aunt" at head of this grave and at the foot of Susie Fields. Age 38. All info from obituary.